INDIANAPOLIS (AP) — When Ryan Tannehill looks across the field Sunday, he’ll see an encouraging sign in Andrew Luck’s comeback. Six years after the Miami Dolphins drafted Tannehill seven picks behind Luck, Sunday’s starting quarterbacks seem to be following similar paths. Both missed all of last season with injuries. Each is trying to make a late-season playoff run. And Tannehill hopes to prove he, like Luck, can successfully return from a problematic throwing shoulder. Actually, Luck is playing the best football of his career — more than 21 months after undergoing surgery for a partially torn labrum in his right shoulder. Throughout his extended absence, Luck dealt with physical pain and mental anguish, brought on at least partially because he couldn’t help his teammates when they most needed him. Tannehill understands after missing the previous five games with an injured shoulder capsule. Similar to Luck, Tannehill had to be shut down at one point from throwing. But last week’s bye gave Tannehill enough time to get back. 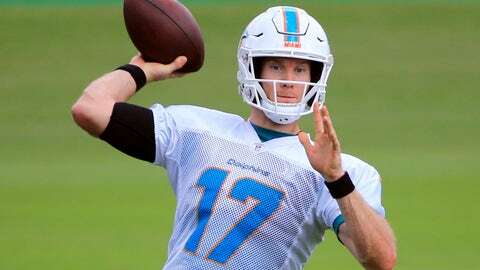 Coach Adam Gase announced Tuesday that Tannehill would be back in the lineup against Luck, even though Tannehill acknowledges he may play the rest of the season through the pain. The Dolphins need Tannehill to be at his best. They haven’t scored a touchdown in nine quarters and are one of five teams, along with the Colts, tied at 5-5 for the AFC’s No. 6 playoff spot. This week’s challenge could be daunting. During their four-game winning streak, Indy’s defense is allowing just 17.5 points per game and Luck has thrown at least three touchdown passes in seven consecutive games. If the conference’s reigning offensive player of the week throws three more Sunday, he will break a tie with former Dolphins star Dan Marino and tie former Colts star Peyton Manning for the second-longest streak in league history. Luck also is on pace to set career highs for completion percentage and passer rating — not bad for a guy some thought would never regain his pre-injury form. And if Tannehill’s body starts feeling better, perhaps the results will follow. Dolphins running back Frank Gore returns to Indianapolis for the first time since becoming a free agent last winter. While Gore wants to show his former team what it’s missing, the Colts still hold Gore in high regard. Miami’s Kenny Stills has only 19 receptions this season, but four have gone for touchdowns and he’s likely to see more balls thrown his way with receivers Albert Wilson and Jakeem Grant out for the rest of this season. Colts kicker Adam Vinatieri became the NFL’s career leader in regular-season wins (210) last week. During Wednesday’s team meeting, Reich put the milestone in perspective for his young team. The Dolphins have lost four straight road games by a combined score of 138-59. And since the middle of last season, they’ve lost nine of the past 10 outside their home stadium. Miami hasn’t played at Indianapolis since 2013, but it did win that game in Luck’s second season.